A popular medieval European dessert that faded out of style in the mid-20th century, compote (COM-poat), also referred to as poached or stewed fruit, is mix of fruits cooked in a syrup. Although a single fruit can be cooked in the same manner, a variety is more interesting. In fact, the name derives from the Latin compositus, mixture. Think of it as a cooked fruit salad. It was once so popular that people of means served it from a stemmed compote dish, designed to show off the fruits (see a photo below). The syrup is made from the cooking liquid—typically water or wine—plus sugar and spices. The syrup could be seasoned with the cook’s choice of cinnamon, cloves, lemon or orange peel, vanilla or other spices. 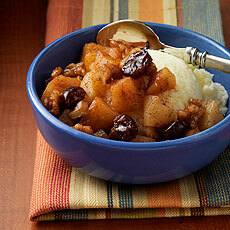 The cooked fruit could be enhanced with candied fruit, grated coconut, ground almonds and/or raisins. In the absence of fresh fruit, compote could be made entirely with dried fruits, plumped in water that was optionally enhanced with kirsch, rum or sweet wine. 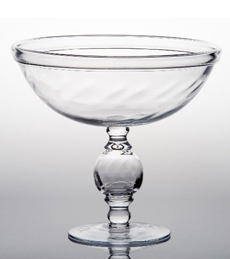 Thus, compote was especially popular in fall and winter, when fresh fruit was limited. Our Nana made it at least once a week during the season. Compote can be served either warm or cold, with or without a dab of whipped cream or mascarpone. Except in Italy, the mascarpone is a modern touch. Nana and the rest of her generation had never heard of it. You can use compote to garnish panna cotta or custard, in an ice cream parfait, even atop plain cake like angel food or pound cakes. 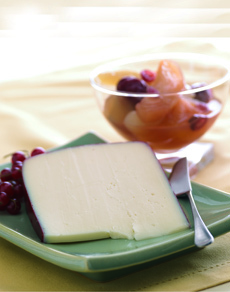 You can even serve compote with a cheese course, with or instead of fresh fruit. TOP PHOTO: Apple and cherry compote on ice cream. BOTTOM PHOTO: Compote with a cheese course. Photos courtesy Wisconsin Milk Marketing Board. This recipe, from the Wisconsin Milk Marketing Board, combines classic seasonal fruits—apples, pears, quince and dried fruits—with modern touches like star anise, another ingredient that wasn’t in American grocery stores in Nana’s time. For a holiday version, here’s another recipe: compote with cranberries, oranges and maple syrup. *If you don’t have star anise and don’t want to buy it, for each star you can substitute: 3/4 teaspoon crushed anise seed, 1/4 to 1/2 teaspoon anise extract, 1/2 teaspoon Chinese five-spice powder or 1 tablespoon anise liqueur or other licorice liqueur. 1. PLACE the first nine ingredients (up to and including the bay leaves) into a pot and bring to a boil. Stir to dissolve the sugar; then reduce the heat to low and add the fruit. 3. BRING the poaching liquid to a boil and reduce it by half (it takes 5 to 10 minutes). Taste; if necessary add more lemon juice to balance the flavor. Strain the syrup and carefully ladle it over the poached fruit. The cooked fruit will keep in the refrigerator for about a week. †The fruit should be tender but not mushy. Cooking times vary for different fruits: 10 to 15 minutes for dried fruits, 20 to 30 minutes for pears, 30 to 45 minutes for apples and one hour for quince. A simple compote dish. They could be quite elaborate: etched crystal, garnished in gold, etc. Photo courtesy Abigails | Amazon. No doubt, fruits have been stewed since the invention of clay pots, some 17,000 years ago in China. But the oldest known recipe we have, for a pear and fig kompot, dates to the early Byzantine Empire (330 C.E. to 1453 C.E.). Here’s the recipe for that ancient fruit compote, it’s made with dried fruit, date syrup and pomegranate molasses. Because it was easy to prepare, made from inexpensive ingredients and contained no dairy products, compote became a staple of Jewish households throughout Europe. Make it one of your household’s desserts! ‡Sugar was little known in Europe until the 12th century or later, when the it was brought back from the Crusades. Even then it was rare and costly; honey or dried fruits were the common sweeteners. In southeast Asia, where sugarcane originated, it has been in use for 1,000 years or so.